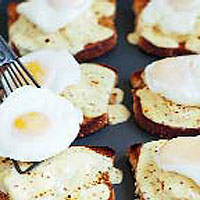 This rarebit recipe is made more substantial by adding smoked haddock and poached eggs. Cut the fish into 6. Place in a pan with the milk and bring to the boil, then remove from the heat immediately and set aside for 5 minutes. Meanwhile, preheat the grill to the highest setting and toast the bread lightly on both sides, then place on a baking sheet. Heat the cheese sauce according to the pack instructions. Stir in the mustard. Drain the fish thoroughly and place a piece on each slice of toast. Spoon the hot sauce over evenly. Return to the grill and cook for 2-3 minutes, or until golden. Meanwhile, bring a pan of water to the boil, reduce to a simmer and gently crack in the eggs. Poach them for about 4 minutes until soft, then, using a slotted spoon, place 1 on top of each rarebit. Serve with a handful of watercress.